I found this on A Morris Blog before Valentine's Day this year but just didn't have time to share it then. So, off to the files it went and here it is now! I think it's a great lovey-dovey little treat. Simple, right? Love the idea! I'm a little too busy to make some for me and hubby right now...maybe somebody feels like overnighting some of their fried deliciousness to me? What a cute idea, and so simple! sooo yummy! bookmarking this recipe!!! hehe. 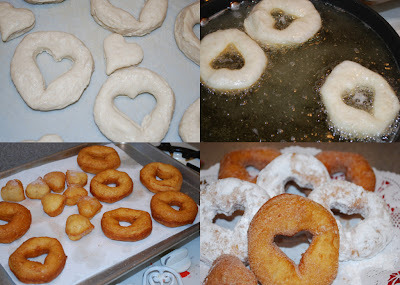 Love the heart shaped donuts! ahhhhhh this brings back sweet memories. When we were newly weds and incredibly poor, we couldn't afford to always go get donuts, but we could afford the cheap 4 for $1 biscuits cans. Sometimes you could find them for 6 for $1. We would make up our own donuts. Yummy! You can also glaze them with a little powdered sugar and water and vanilla. So yummy and good with hot chocolate. Dee-lish! Can't wait to make these for hubby when he comes home from LA! ooo... those look so good! I might have to do these the night before I head out of town and send them with my hubby (in a bag so he can't see them!) to work the next day with a little note after he drops me off at the airport! Those are seriously cute and look delicious! Ironically I made these just 15 minutes before reading your blog. I love the heart idea. These are so good and very simple to make! Thanks for all your great ideas! I love your blog! There are so many good ideas, I'm torn on which order to try them all in! I wanted to let you know I linked to your blog from mine. Keep the awesome ideas coming! That is so easy even I could do it! Wow, gotta love Pilsbury! At first I almost passed this over cause I can not bake to save my life, but wow...I might be able to make these! Thanks for visiting my blog, its so fun to get to know new bloggers! I just tried to make these and they all turned out doughy in the middle. Even the ones that i left in too long and the outside got crispy, inside doughy. What am I doing wrong? I flipped them over to get both sides. Anyone have a suggestion? I made them for my sick 5 year old, I will try again if someone has an idea? I have made these a few times and they turned out great! I just put them in my fry daddy for a couple of minutes on each side. Then I sugar coated some and used a mock krispy kreme chocolate glaze recipe for the others. They were delicious and soooo easy to make!